A young couple venture into a summer beach house and make passionate love, unaware that they are being observed by a demented doctor who later uses the girl as part of a bizarre experiment. A group of aliens plans to invade Australia as a means of taking over the Earth. In order to communicate with the people of Earth, they bring a statue of the long-dead Duke of Edinburgh to life. Narrator: [voice-over] Once upon a time, there lived a real fast guy. His life was fast. His friends were fast. Heh - even his food was fast. But he was still not satisfied. He wanted to share his fast philosophy with someone else, a beautiful girl. Trouble was, she was in the arms of... another man. 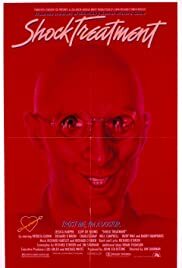 Shock Treatment is an extremely strange movie, the plot is all over the place, the songs are weird and the confusion factor for the viewer is high. But Shock Treatment is a good movie. Forget everything about RHPS, there are no singing tranvestites or Meat Loaf getting hacked to bits with an axe, Shock Treatment is very different. It is a funny satire about how television has become an obsession. It's also about Brad and Janet Majors, who become contestants on a show called Marriage Maze and Brad is committed into a mental asylum, placed convieniently inside the TV studio. It's funny to see most of the cast return for a great big musical full of memorable songs. But a warning to the gay community, one song contains the lyrics.."Faggots are maggots-thank god I'm a man!" No consumer advice but it really doesn't need any. There's nothing that troubling.